While it's fair to call The Usual Suspects a gimmick in search of a movie, one could say something similar of, say, an Agatha Christie mystery. 105 min. PolyGram Filmed Entertainment. Director: Bryan Singer. Cast: Stephen Baldwin, Gabriel Byrne, Chazz Palminteri, Kevin Pollack, Pete Postlethwaite. Remember the "Magic Eye" craze of the 1990s? One might call The Usual Suspects the narrative version of "Magic Eye," inviting a gaze into its "depths." And while it's fair to call The Usual Suspects a gimmick in search of a movie, one could say something similar of, say, an Agatha Christie mystery. Director Bryan Singer's breakthrough picture just looks better with age: it has confident atmosphere, makes good use of actors, and wears its twistiness well. The latter certainly paid off for screenwriter Christopher McQuarrie, who won the Oscar for Best Original Screenplay. Spacey's career got extra kick when he, too collected an Oscar (for Best Supporting Actor), and Singer has never looked back. 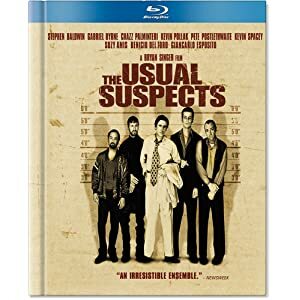 The story concerns five career criminals brought together for a NYPD lineup: Dean Keaton (Gabriel Byrne), Michael McManus (Stephen Baldwin), Todd Hockney (Kevin Pollak), Roger "Verbal" Kint (Spacey) and Fred Fenster (Benicio Del Toro). In lockup, they're at each other's throats, but as the saying goes, you're not paranoid if someone's really after you. Jail ironically affords the crooks the opportunity and motivation to plan a heist they can carry out together, but before they can bask in their success, they're confronted by a mysterious character called Kobayashi (Pete Postlethwaite), who explains that he's a representative for the fearsome criminal mastermind Keyser Söze. Each of the men has, in some way, taken money out of Söze's pocket in the past, usually without realizing it. Now Söze intends to collect on what he believes he's owed. And so the men reluctantly proceed with Söze's dirty work, a doomed job—doomed, we know, from the film's opening scene, depicting a flaming ship, littered with bodies, in the Port of Los Angeles. McQuarrie is smart enough to know that he needs to take the simple elements of his story and plot the hell out of them to keep us busy while he hides in plain sight the answer to the all-consuming question "Who is Keyser Söze?" Your mileage may vary on how surprising the answer turns out to be, but The Usual Suspects is never boring, thanks to the craftsmanship of McQuarrie, Singer, and the pleasingly idiosyncratic cast. Pollak does some of his best work here, adding acid wit without ever allowing the audience to see him as harmless; Baldwin's role is boilerplate angry tough, but he plays it to the hilt; Del Toro's performance is pure, spontaneous joy, from start to finish; a superbly subtle Byrne is all quiet menace (and anguish); and Spacey makes a meal of his theatrically quirky role, a talkative limper that would've once gone to Peter Lorre. In the margins, there's more to cherish, from Postlethwaite's weird and wonderful aide de camp to Chazz Palminteri's confident detective Dave Kujan (whose lengthy interrogation with "Verbal" weaves through the narrative). All in all, The Usual Suspects is a skillfully moody neo-noir picture worth staring into for a couple of hours. 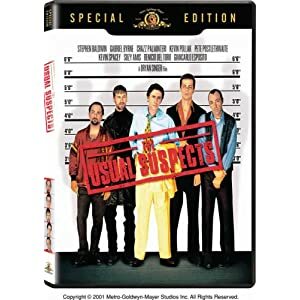 MGM first released The Usual Suspects on Blu-ray back in 2007, and now that disc gets repackaged in a nifty Digibook with a nifty 24-page glossy color booklet that includes photos, essays, trivia, and cast bios. The picture quality is quite solid: as it should thanks to the hi-def resolution, the image looks better than ever on home video. The all-important black level is solid, detail takes a big leap up from DVD, and color and contrast are perfectly calibrated. The DTS-HD Master Audio 5.1 mix is more than adequate to the demands of the aural source material, which is humble: this isn't the disc to test your speaker system, but it's clear, with always intelligible dialogue and solid delivery of effects and music. Unfortunately, MGM's Blu-ray did away with all of the special features found on the DVD Special Edition, and they haven't been restored for this Digibook release, so the film's die hard fans should hang on to that disc for now. All site content © 2000-2019 Peter Canavese. Page generated at 04/18/2019 11:25:07AM.